By the way, this process is often described as scraping data with a browser. On Internet Explorer: press F12. 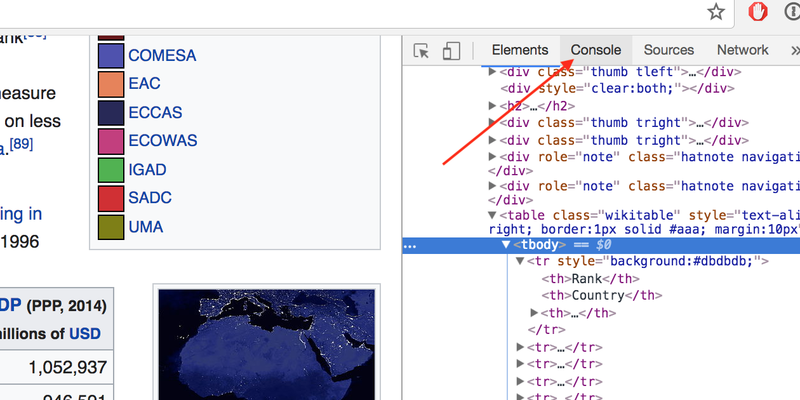 On Google Chrome: click on the menu, then More Tools, and select the Developer Tools (see picture below). 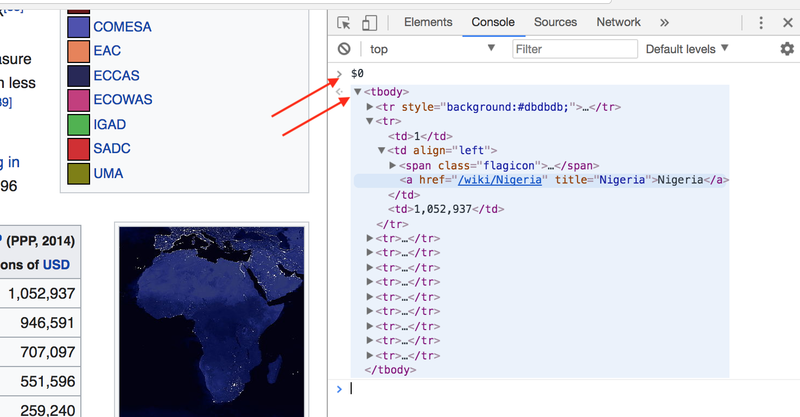 Notice that there is a $0 after the tag <tbody>, this sign allows us to process the element table, in other words, the $0 is the table now. Then write $0 and click enter. The table select earlier is now on the console. Be sure to use the straight apostrophe instead of the curly apostrophe around the tr. The table is a set of lines and columns, and this is how it is accessible: wholeTable[Line].cells[Column]. The inneText is just a way to display the data in the cell. I create an empty object tempObj (an array) to copy the cells’ data in the object properties’ Country and GDP. If you are using another table, feel free to write the titles that correspond to the table you would like to copy. The following line parseFloat(wholeTable[i].cells.innerText.replace(/[^\d\.\-]/g, “”) is just a trick to convert the text to a value, otherwise I will get a string instead of a value. Well, guess what, the table is ready. The last step is to copy and paste the tempObj and use it in any environment you want. Write copy(tempObj) and press enter. Check here. Feel free to share your experience using this method or another method. You are also welcome to ask any questions about this topic.